Coinciding with 2018’s year of the Dog, Fortune Dogs from Habanero adopts its theme from Chinese astrology to produce a canine-filled slot with a mini, minor, major and grand jackpot of up to 200x, 600x, 2,000x or 10,00x your total bet! Gazing beyond the five translucent reels of this horizontal-pays slot, the cartoon-like setting for this anthropomorphised canine slot is the streets of China town dotted with signs painted in Mandarin. The symbols are divided into a high win and low win. Constituting the high win symbols are five canines: bamboo-hat wearing, bloodhound police dog, pearl-wearing shi tzu, bowtie-wearing Chihuahua and rough-looking bulldog. Very common and simultaneously nonthematic are the four poker suit symbols. Audio effects enhance the theme with the sound of Asian music, dog sounds like the barking, growling or whimpering amongst other sides you’ll hear. The slot has a child-like innocence that may not be to everyone’s taste. The noodle box is the wild symbol can appear on any space and substitute for any symbol. Five of these wilds in a row will credit you a prize of 10,000 coins. The paw print scatter can also appear on any position, and it will leave its mark by crediting you with 1, 5 or 10 times your total bet. The traditional gold coin can appear on the 2nd to 4th reels which count towards the mini, minor, major or grand prize pot feature. The feature is triggered with 3+ traditional gold coins turning up in the base game. In this feature 15 red traditional coins are presented, inviting you to choose until you reveal 3 of a kind: gold for Grand prize, silver for the Major prize, bronze for Minor prize and copper for Mini prize. 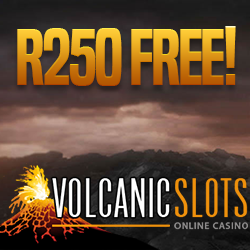 These prizes range from 500x to 10,000x, 100x to 2,000x, 30x to 600x or 10x to 200x your total bet. When one of the higher-value symbols lands on the 1st reel then all instances of that same symbol on the other reels become double acting as two symbols. When any of the higher-paying symbols appear on the 1st and 3rd reel, then all instances of it turn into triple symbols. Effectively this could mean that it is possible to form paylines of 10 or 15 symbols. The eight free games feature is triggered with 3+ dog paw print symbols that leave their mark after a base game spin. This feature can be re-triggered while it is active with 3+ gold coin. 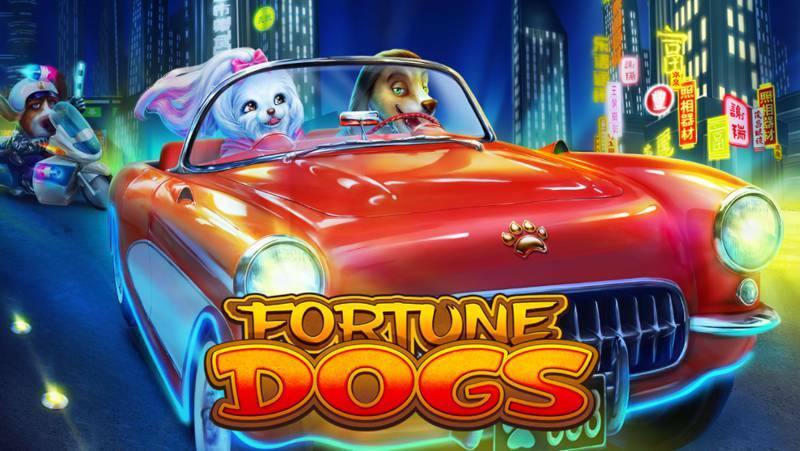 Fortune Dogs slot has an RTP of 98% with a high variance so winnings of anything large will likely be harder to come by so you may need a larger bankroll if you want to play long for a better chance at cracking a jackpot. The coin values range from 18 to 180, and you can enjoy the slot from your Windows Phone, iOS or Android device. 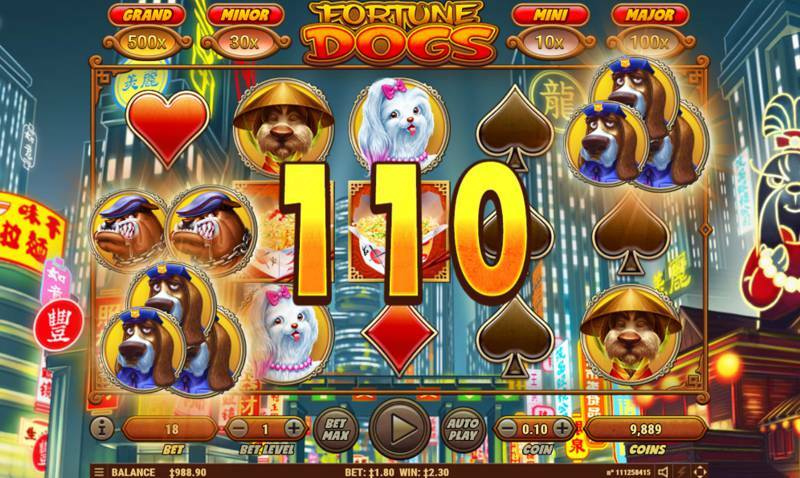 Fortune Dogs is a fun Chinese dog themed video slot games that is worth a walk around the block at least.